I’m always excited in anticipation of receiving a new book. I should have learned by now that over-excitement more often than not leads to disappointment. I can only think of one occasion offhand where my expectations have been well and truly exceeded. And quite a few where I have been crestfallen to a greater or lesser degree. But, that’s all part of the drama and excitement of being a book collector. It’s always, at the very least, interesting. On this occasion I did have high hopes. The flaws were described well in the auction, but weren’t noticeable in the provided image. I thought, “Great, he’s being very honest about stuff that needn’t be mentioned”, but it wasn’t quite that way. Let’s have a look. At casual glance, looks great!! But careful inspection of the image reveals what I couldn’t see in the auction. 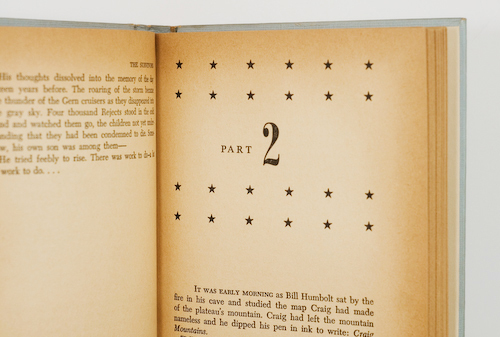 Now, you can see the two flaws described in the auction as “…two small tears on top border of front cover.” One indeed is a small tear with an associated crease about three times the length of the tear running up to the edge. The other is not a small tear. It is a large tear. And the creasing is also significant. These I would have definitely spotted in the auction and hence my surprise upon receipt of the book. The image was apparently from a different copy he had up sometime in the past. Boards are in good condition. Currey ‘B’. The view from the top and bottom is, aside from that tear, very nice. Spine sits nicely and the binding is very tight. The head and tail are likewise in excellent shape. The GP bugbear of the poor quality paper shows itself with the typical age-toning of the block. Not as bad as some that I have. 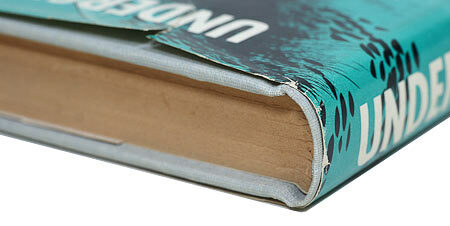 Nice ocean surface rippling across the top of the chapter pages too. The back of the jacket is nice and white and exhibits little rubbing or wear. 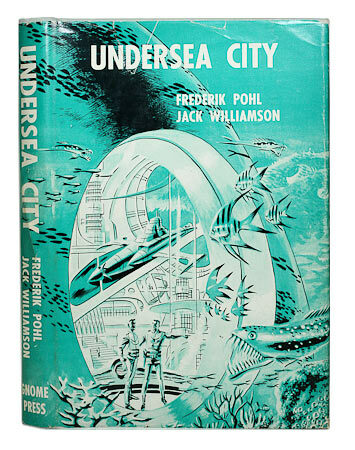 Chalker & Owings: UNDERSEA CITY, by Frederik Pohl and Jack Williamson, 1958, pp.224, $3.00. 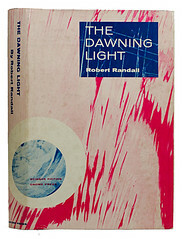 5000 copies printed, but only 3000 bound in two bindings, first black boards (about 2000), second gray cloth c.1959 (1000); rest “remaindered” and probably destroyed in liquidation. Jacket by Wallace Wood. Reprint: Ballantine. 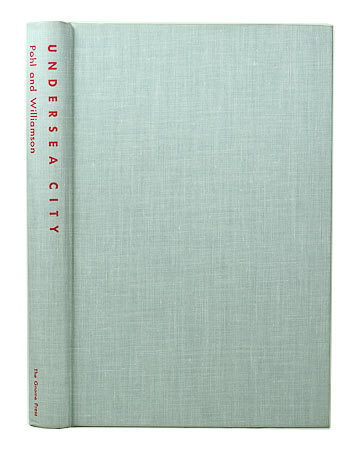 Currey: UNDERSEA CITY, Hicksville, N.Y.: The Gnome Press Inc., Publishers, . Two bindings, priority as listed: (A) Black boards lettered in red; (B) Gray cloth lettered in red. 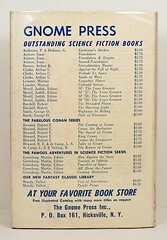 First edition so stated on copyright page. Comments: Damn tear on the cover. 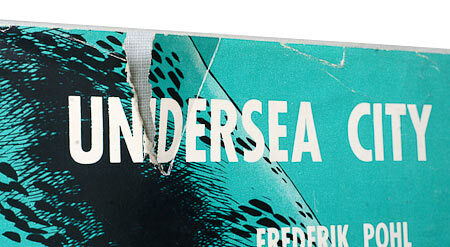 I don’t know how to rate an otherwise VG+ book with a defect like that. Offset to a certain degree by the truly outstanding price for this title. I’m doing something a little different for this Close Up. Since these two books are effectively one continuous story, we’ll examine them together. Looking at the two together illustrates something immediately. It illustrates one of the things I wish never happened. One of the things I struggle to understand. 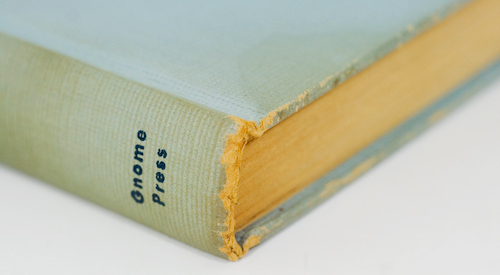 One of the things I find disappointing about Gnome Press. This: Why did the cover art go from wonderful, colorful, imaginative and descriptive, to… crap?? I suspect there are several answers to this question, and I’ll attempt to address this issue in it’s own post sometime. For the meantime, we can see what I’m talking about here. On the left, nice art, attractive, makes me interested. On the right… not. I usually give you bigger pics to enjoy, but I’m trying to put them side-by-side on this occasion. If you want to see in more detail, just click the image and it’ll open the appropriate page on the Gnome Press Flickr site. Both books are very similar in condition. They look good from a distance, but up close not so much. We’ll have a closer look at this later. Let’s take the jackets off. 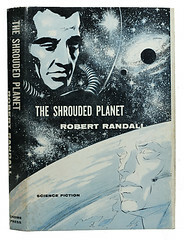 ‘Planet’ is in a little better condition here. ‘Light’ has a bit of spotting on the boards. Looking at the top we can see the usual darkening of the block. ‘Planet’ is a bit ahead here too. It’s difficult to tell from these pics, but time has been a little kinder to ‘Planet’s’ text block. You can also see that ‘Light’ isn’t quite sitting flat. 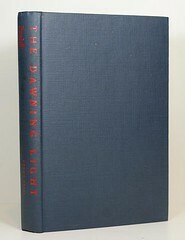 This is because I photographed it just after putting a dust jacket cover on. I took the pics of ‘Planet’ prior to doing so. 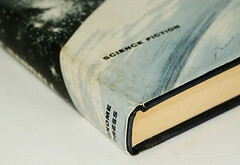 The spine is a little more secure on ‘Planet’, you can see a slight lean there on ‘Light’ though that is exaggerated by the Brodart cover. The difference in the darkening on the block is a bit more evident here. The jacket on ‘Planet’ is a little worn on all extremities. 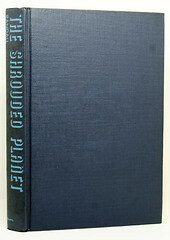 Though the jacket on ‘Planet’ is a little worn, ‘Light is in pretty good condition around the edges. However, if you look closely at ‘Planet’ you can see an issue that both jackets share and is also quite serious on both. Foxing. Let’s have a closer look at portions of the jacket now. You can see it prominently now, especially if you check out the larger pics. I didn’t take a pic of the inner side of the jackets, but it is worse there. 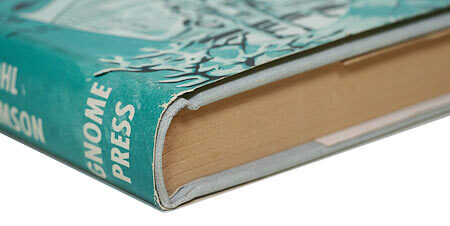 Very noticeable on the endpapers too. ‘Planet’ is obviously suffering less in this regard and ‘Light’ does have issues as you can see. 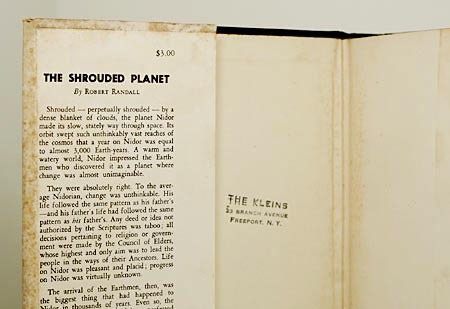 Check out a previous owner’s embossed stamping there on ‘Planet’, which also has another owner’s stamp on the front paste-down. 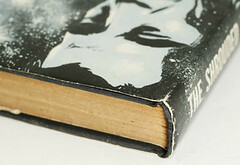 You also get a good view of the extent of the foxing on the dust jacket. It’s evident all over, but this is about the worst spot on the book. 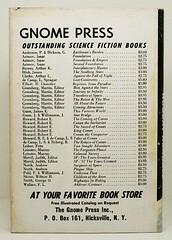 I mentioned both books have the typical Gnome block browning and ‘Light’ is the worst off. Almost in the same league as the copy of The Survivors I have. The back of each book is quite nice and rip/wear free, the foxing is the big turn-off. If it wasn’t for this endemic problem on these two books, their grade would be VG to NF. Alas, this issue relegated both of these copies down to G I think. It’s a shame, as otherwise they are both in great condition. 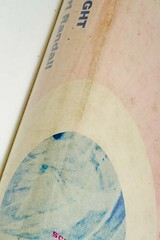 Binding: Navy blue boards with sky blue lettering on spine. Comments: Text block darkening and foxing on an otherwise nice copy. Two previous owners stamps. 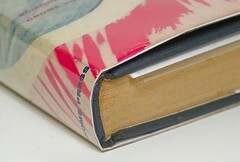 Binding: Navy boards with red spine lettering. Comments: Significant block darkening and foxing on an otherwise nice copy. These two books to my mind are in exactly the same condition. There are a lot of issues with this book. There are a couple of interesting points also. I picked it up as part of a package that included The Unpleasant Profession of Jonathan Hoag and Sixth Column, both by Heinlein and Shiras’ Children of the Atom. The four books together (once I subtracted shipping) cost $490. $210 for Hoag + the remainder for the other three. I budgeted $180 for Sixth Column and split the difference on the other two: $50 each. 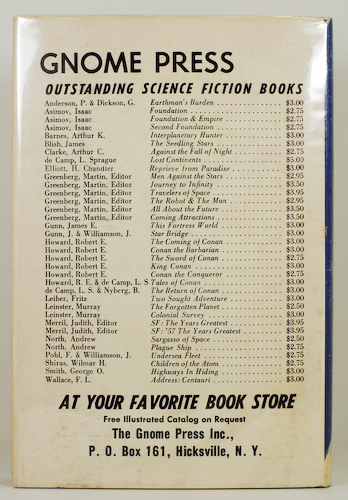 $180 is certainly a great price for a 1st ed Heinlein that’s in pretty good shape as you’ll see in a future Close Up, so I think $50 for The Survivors and the same for Children of the Atom represent excellent buys. These are all sought after GP titles. 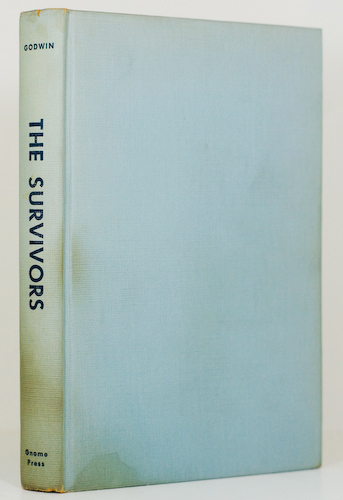 By way of comparison, an inferior copy of The Survivors went for $75 on eBay several days ago. I like this cover. It’s impressive, it’s dramatic and it bodes well for the content. There is no artist credited for this in the book, but Wikipedia suggests that one Wallace Wood is responsible, a very well known illustrator and comic artist. Well, at least to those in the know, I hadn’t heard of him before. 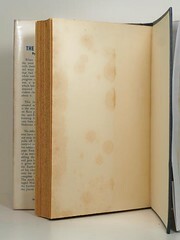 A stain near the spine there and that nasty darkening is caused from reading the book without a dust jacket on. Oil and dirt from the hands gets into the boards after too much handling. How do I know this?? Because I have done it myself to another of my Gnome Press books, van Vogt’s The Mixed Men. Here’s a closer view. So let’s get all the bad stuff out of the way. While we’ve got it stripped like this, we’ll continue to check out the exterior. 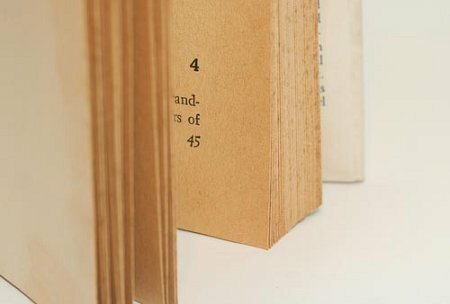 There is a split beginning to form along the fold (I don’t know the correct term for this feature) down the spine and when the book is handled, you can feel the looseness in this area. 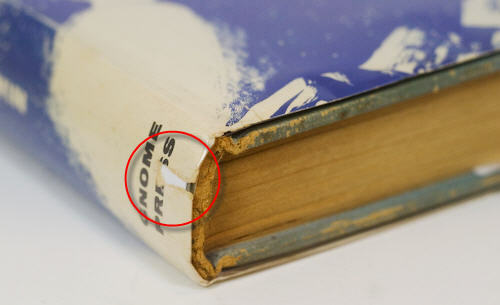 The top and bottom of the spine are likewise damaged. Some wear and a chip off the top there. And some significant chipping at the base. Enough of that. When we put the clothes back on it doesn’t look so bad. The top and the bottom check out ok if we ignore the aforementioned issues. 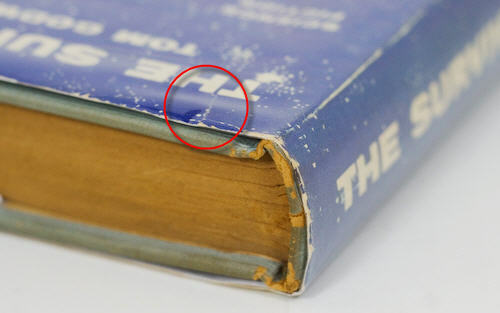 There is a little wear along the bottom edges of the boards, and you can see that the spine still sits reasonably square despite being rather loose. …and that unsightly open tear at the bottom. You can see as I mentioned that otherwise the dust jacket looks great. Once we look inside it gets interesting. 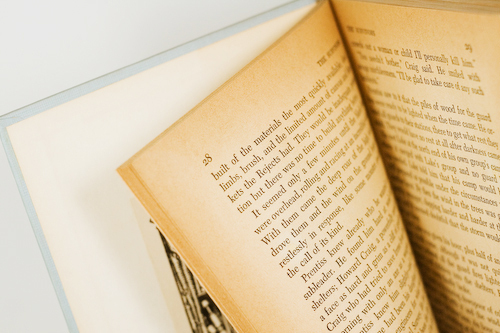 There is some debate as to how a bookplate actually affects a books value. Some think it doesn’t matter and others consider it a blight. Personally, I love them, as long as they are cool, like the one in this book. 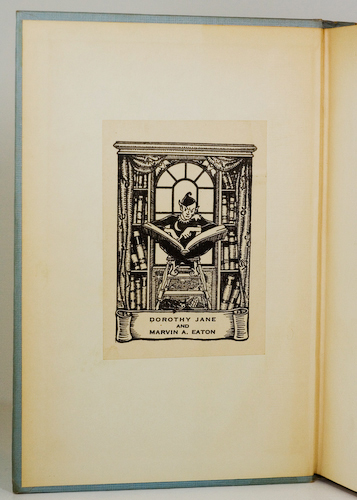 I have one other with a bookplate – The Mixed Men, and I think the plate on that book is even better than this one. You’ll see it sometime. 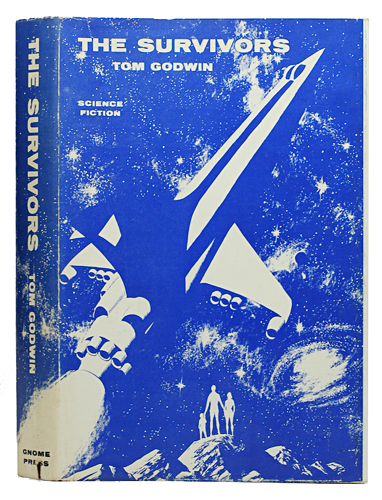 They add real character to the books and are a point of attachment from whence those lost days of classic science fiction, when people actually maintained their own libraries are tangibly brought forth. I often talk about the provenance of a book and here is a fine example of what I’m talking about. I can feel the ’50s when I see things like this. Great stuff. 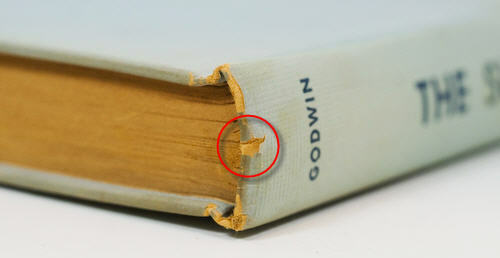 Another thing I always mention especially in connection with GP’s later books is the browning of the pages. There is very significant browning here. 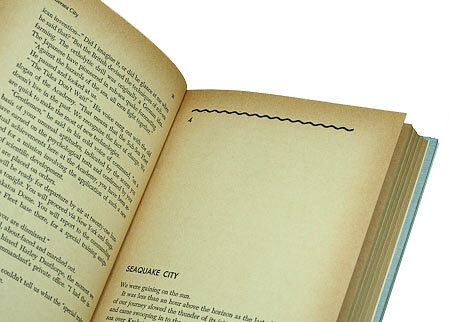 You can see the extent of it when you contrast the pages against the front paste-down. Wow. I think this is the worst in my library thus far. 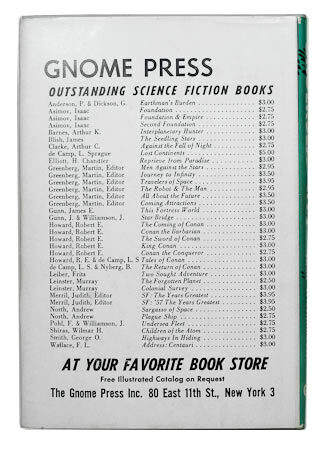 One cool thing that Gnome Press did in their books was to individualize them. What I mean by that is applying nice touches such as the half-moons I illustrated in Agent of Vega, and in this book we have a nice array of stars helping to introduce each of the four parts. Nice. Some people think it looks tacky, and I guess from a contemporary perspective it does, but it’s classic ’50s. I love it. 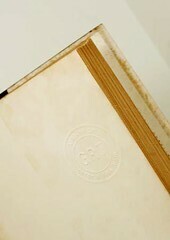 The rear of the jacket looks fine, it’s nice white aspect helps to hide the serious issues underneath. 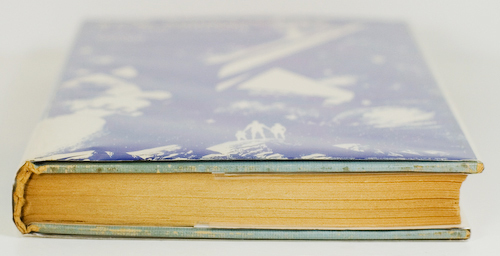 This is the longest Close Up I’ve done thus far – a reflection of the poor condition of the book. 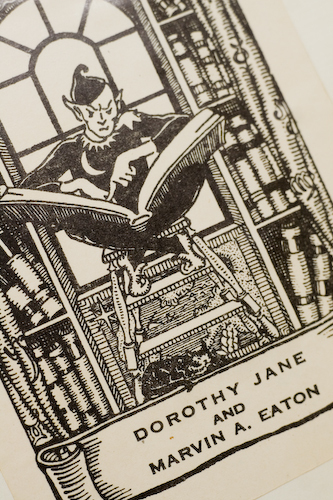 So, let’s finish on a high note and have a closer look at that book plate. Beautiful. But just who are Dorothy Jane and Marvin A. Eaton?? 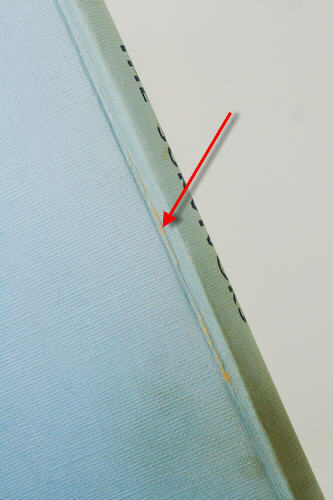 Binding: Sky blue cloth with dark blue lettering to spine. 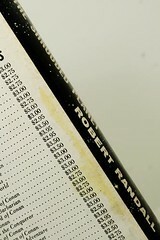 GP Edition Notes: 1st edition so stated on copyright page. Comments: The jacket is excellent despite those couple of issues but it hides some damage in the loose spine and obvious mishandling. Still, for a title such as this for $50, a nice acquisition.